We're starting a new On Landscape feature where we'll be inviting photographers along to provide feedback on submitted photographs. Getting feedback on your photography is critical to your progression as a photographer. For most photographers this typically happens when they meet up with some friends on when they post images on Flickr but from watching participants in photography workshops it's obvious that getting feedback from respected photographers is something most people find invaluable. 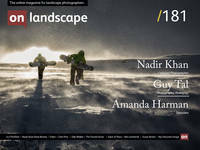 To help our On Landscape subscribers get their photographs in front of some of our contributors we're starting to hold a regular blind critique session. This one hour long webinar will give insights into composition, technique and post processing and our first guest critic is one of our favourite contributors, David Clapp. Our host Tim Parkin will be showing David Clapp approximately 15 photographs without knowing who has submitted them. Submissions for images are now closed, but please join us for what will be an informative and interesting discussion.